Basheer’s life is as restless as his prose. His stirrings for revolution began from a young age. He left high school to join the freedom movement. He went to Malabar to take part in the Salt Satyagraha. He was imprisoned, promptly, even before he could participate. His inclination landed him in jail for three months. He was released in 1931, after the Gandhi-Irwin Pact. He continued to support the freedom struggle and edited a revolutionary journal. When a warrant was issued for his arrest, he left Kerala. His flight from Kerala marks the beginning of a unique, Sufi-esque journey of discovery. He traveled throughout China and Africa, across the length and breadth of the pre-Indian nation. He wandered for years, keeping starvation at bay by working a variety of odd jobs. He worked as a daily wage laborer, a cook and a newspaper man. He lived with Hindu ascetics and Sufi mystics – following their customs and practices. 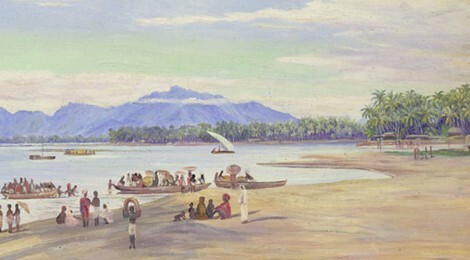 He returned to Kerala in the mid-30s. Here, Basheer came to writing in desperation. After years of trying to find a steady job, he walked into the office of a small newspaper. It was a poorly funded one-man operation that promised to pay Basheer for a story. His first story was a path breaking romantic fiction, Ente Thankam (My Precious). Its unconventional female protagonist was a hunchback. Basheer continued to write prolifically. He authored several novels and countless short stories. Most popular amongst these are Balyakalasakhi (My Childhood Friend) – a tragic tale of childhood love, Shabdangal (Sounds) – a story of the life of a World War-II soldier, Mathilukal (Walls) – about love that blossoms between two prisoners who never see each other, Janmadinam (Birthday) – narrates the difficulties of a young man while trying to eat on his birthday and Anargha Nimisham (The Limitless Instant) – a collection of short stories that deal with philosophy and spirituality. The first piece of The Limitless Instant is a prose poem of the same name that speaks of self-annihilation that can be interpreted equally as a Sufi/Bhakti description of love/longing for God or a romantic description for longing for another person. It is translated below. From the fact of you and me, in the end, you alone will remain. You alone. The time for travel has approached very near. Like a monsoon cloud on the verge of rain, this sobbing memory bursts from my inner-soul. My friends do not know of this condition. Sometime somewhere they approach me; they push me to spin tales to make them laugh. For their sake, I tell a tale of some kind or the other. I am laughing with them. They do not hear the din of the pain within my laughter. Here I am going to fuse into oblivion. An unimportant event. Or of the utmost importance? Something … happened–is that important? No matter what, I am the limitless instant between the two. A past tense tucked into the hem of the present tense. There are so many who scattered. So many have already gone. The countless millions who went before me–Memory aimlessly heads to touch the beginning. Beginning…! It is as though I have merged into the unknowable border of vastness, mystery. There, a din..The endless endless chaos of primordial stirring. All these years, with limitless compassion, you loved me. You tolerated me. You know everything about me. I am like an light novel you can effortlessly read again? For me you remain a great secret. Even after all these years … I was not able to learn anything about you. I loved you without knowing you. Without knowing, I hated you. Knowing fully well, did I cause you pain? Even still, even still you loved me.Tolerated me. I have also told you many secrets. And you have seen all my actions. Will you make me an object of ridicule? You must understand it is because I loved you. When did you and I meet? Did we meet? I tried. In the end, I only learned to love. No. If only I could learn properly one more time. Ignorance. I did not know anything of significance. Just like I came, I am returning alone. The time for travel has approached very very near. Close to two decades after his death (he died on July 5, 1994) and three decades since he was awarded a Padma Shree by the Indian Government, Basheer stands as a towering figure of critical insight – both for Keralites and for Indians in general. His writings have been translated into numerous languages and inspired innumerable plays and films. His writings and the struggles they emerged from speak to the various hopes and challenges that forged the Indian nation during the early part of the century. His observations and his clinical cynicism coupled with his faith in fundamental values are perhaps far more valuable today than ever before. His message seems vital: while we cannot lose hope in the the fundamental truth of human equality, we must always stand as careful observers to the insanities and injustices of the human condition. Equality and fairness are things that we must always strive for. They are never freely given. He cautions repeatedly: so long as there is more than one human being on earth, there will always be cause for conflict. Regardless, we cannot surrender our critical faculties. We can sacrifice all else, but we should never sacrifice our minds.